Properties in Tennessee average 4.6 out of 5 stars. 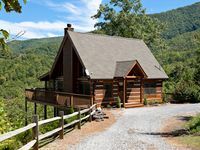 Property 8: Brand New Cabin:Convenient to Everything the Smokies has to offer! Property 9: 'Honey Bear Lodge' Gatlinburg Resort Cabin w/Spa! 1 Bedroom Romantic Safari Hideaway - Pet Friendly - Minutes from everything! Property 12: 1 Bedroom Romantic Safari Hideaway - Pet Friendly - Minutes from everything! Cozy, View, NFL Sunday, SuperFast WiFi, Arcade, Gated, Fishing & 2 Pools, Gated! Property 17: Cozy, View, NFL Sunday, SuperFast WiFi, Arcade, Gated, Fishing & 2 Pools, Gated! Property 23: Rich Mountain Retreat! Peaceful, Cozy, Pristine Cabin 10 min. from all attractions! Property 24: Peaceful, Cozy, Pristine Cabin 10 min. from all attractions! Property 26: Mtn. Views & cozy! No clean fees or processing fees! Property 27: A Romantic Secluded Cabin With Mountain Views, Hot Tub & Wood Fireplace! Property 30: Modern Rustic Cabin on 5 acres in Cherokee National with amazing mountain Views! Enjoy Beautiful Sunsets at Romantic Rendezvous! Property 34: Enjoy Beautiful Sunsets at Romantic Rendezvous! Hickory Falls - Book now for summer!! 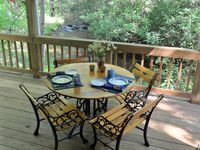 Property 35: Hickory Falls - Book now for summer!! Rocky Top! 2 Bedroom Cabin located in Big Bear Lodge and Resort With Amenities. Property 36: Rocky Top! 2 Bedroom Cabin located in Big Bear Lodge and Resort With Amenities. Perfect get away! Hot tub, grill, chill and relax. Property 40: Perfect get away! Hot tub, grill, chill and relax. Bear Lovin' in Pigeon Forge #unforgettable 2 bedroom w/Gameroom, Views & Heart Tub! Property 46: Bear Lovin' in Pigeon Forge #unforgettable 2 bedroom w/Gameroom, Views & Heart Tub! Property 50: Cozy Studio Cabin w/Fire Pit - Near Cherokee Lake! Rating Details: The property manager was very helpful. The vacation rental was spotless. I was very happy with the location. I was more than satisfied with the condition of the vacation rental. Overall, I recommend this vacation rental. Reviewer Comments: This is a very beautiful cabin in a pretty location. The views were great and we enjoyed the jetted tub and the comfortable furnishings. The only negative was the beds were a bit uncomfortable and probably need to be replaced and there were some minor maintenance issues that need to be taken care of (screen door had a loose screen, painting needed to be touched up, blinds that didn't work). These were minor things that did not detract from our enjoyment of the cabin. It was also very private and did not have other houses right next to it. We would definitely stay here again.